Because it is a daily facial moisturiser that has been specially designed to give your skin everything it needs most to help maintain and improve the healthy look of your skin. - SPF15 broad spectrum protection. Sunscreen and moisture all in one - I use this every day to protect and nourish my skin. It goes a long way and isn't heavy so is good under make-up. Plastic jar means it is light for holiday packing. 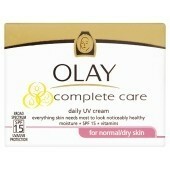 I have tried all the Olay creams with sunscreen and have liked them all. In winter I choose a richer formula aimed at a more mature skin but use this one for the spring/summer. This cream has a nice consistancy not too thick or greasy. It is easy to apply and leaves skin plumped and fresh without any greasy residue.